Another great inspiration from Birthday Express! Disney’s Frozen officially became the best-selling animated film of all-time in 2014, and the world of Frozen is set to grow even more in 2015! Frozen Fever, a short film featuring Anna, Elsa, Kristoff, and Olaf, will be premiering with the new Cinderella movie, on March 13. 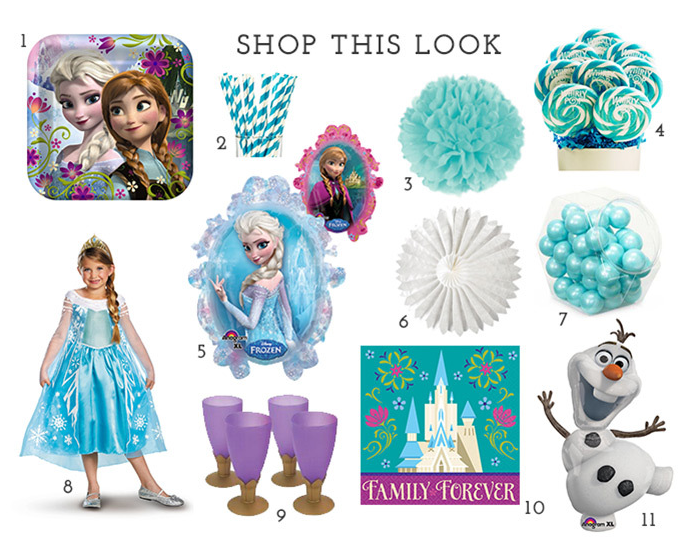 Our collections of Frozen party supplies and party ideas are growing to match, too. 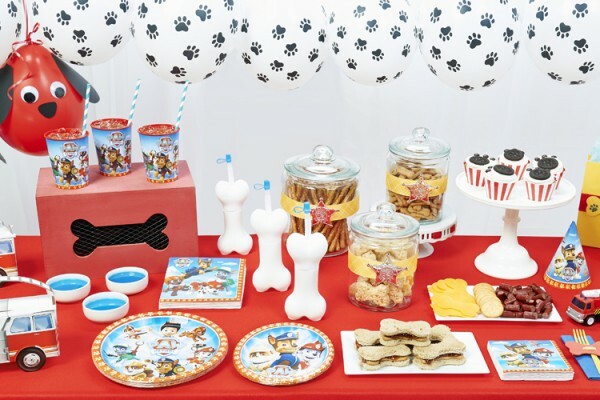 If you and your child can’t get enough of Frozen, you’ll definitely want to check out these party tips. 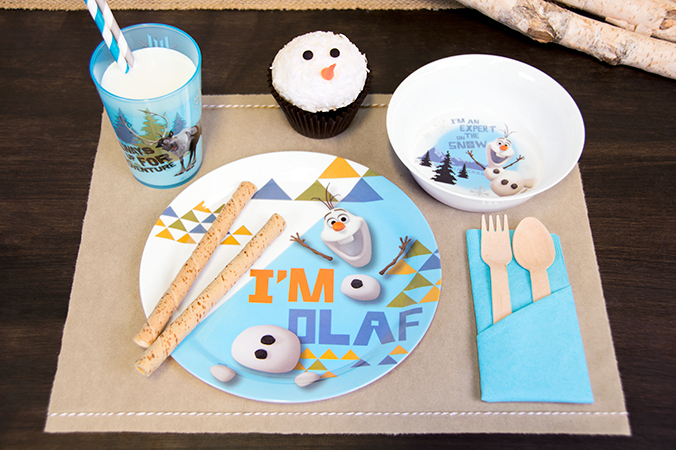 Here’s just one of our new favorite ways to throw a Frozen birthday party, and it’s all about Olaf! The cuddly snowman who loves warm hugs is here to have fun. 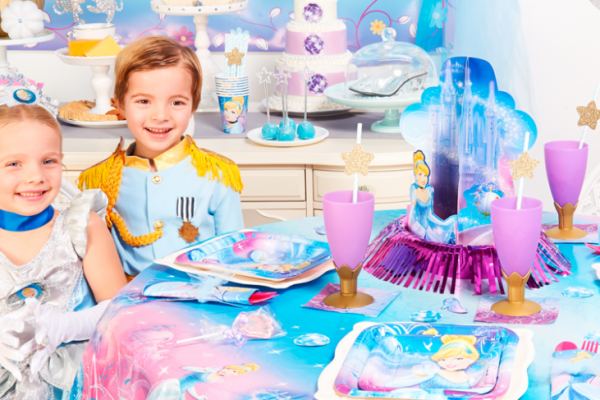 This theme can also be a great idea for a gender-neutral birthday party, as it plays up the Frozen atmosphere without going overboard on princess power. 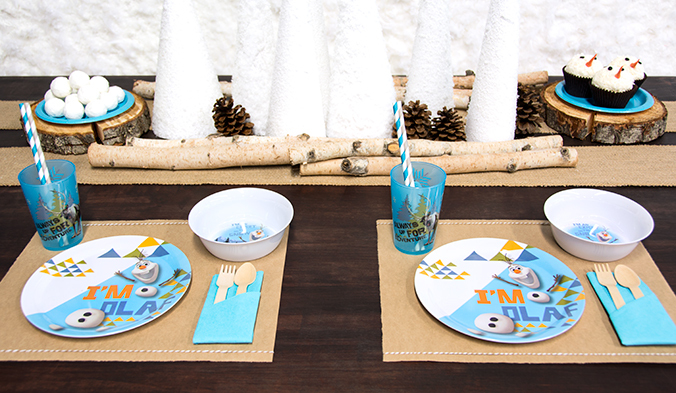 We built up our Olaf party mostly with basic blue and white party supplies. As always, layers are the key! Try accenting with splashes of contrasting colors like orange, and pairing with natural wood textures. Pine cones and faux wood pieces from the craft store are a nice addition to the table. You can make some quick and crafty placemats and table runners from squares of brown paper and burlap fabric, too. This set of Olaf party supplies includes a plastic plate, a plastic cup, and a plastic bowl, all with adorable illustrations inspired by the movie. Not only are they great for giving the guest of honor an extra special experience, but they’re completely washable and reusable, unlike paper plates. Your child will love using them at snack times after the party, too! 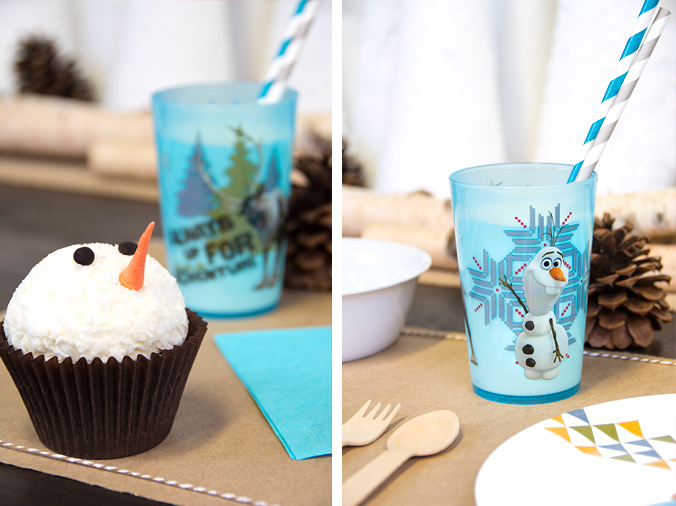 It’s easy to turn any cupcake into an adorable Olaf! Snow some finely shredded coconut onto a white frosted cupcake, and add chocolate chip eyes. To make the nose, color some fondant or gum paste orange, and roll it into a cone shape with your fingers. Make some fingernail marks for texture, and add it to the finished snowman cupcake! 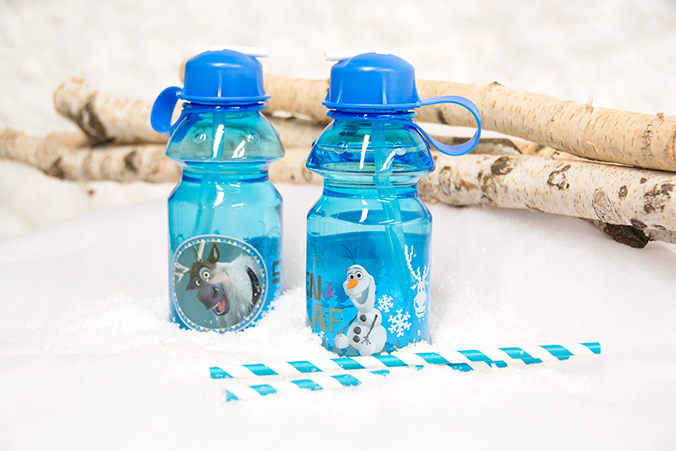 Olaf water bottles can be used as a fun way to serve juice and other drinks to party guests, or they can simply be party favors. Either way, every guest will get a great gift to take home with them. Other ideas for Frozen party favors include these super cool temporary tattoos along with whatever other trinkets and treats you can fit inside an Olaf pinata! The “fire” itself is just a short string of battery powered white Christmas lights. Coil up the cord to give the decoration a little more volume. 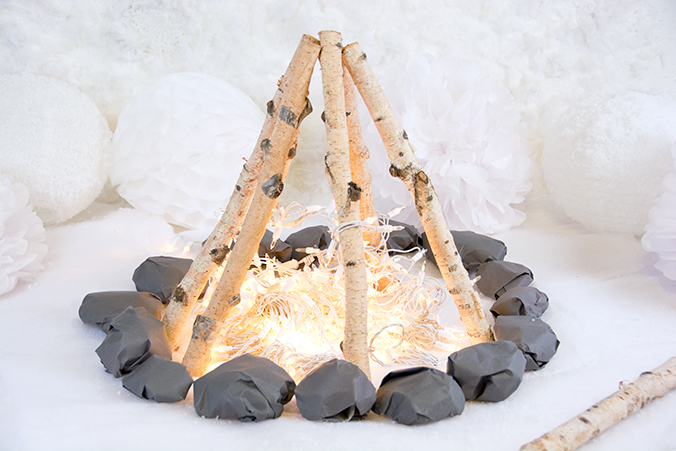 Finally, make some stones for the outside of the campfire with crumpled gray construction paper. 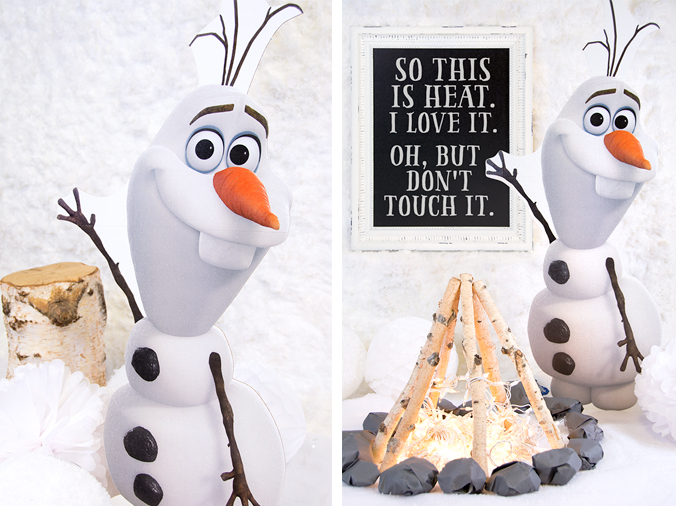 Decorate with your DIY campfire on its own as a centerpiece, or make one for this cardboard Olaf standup to enjoy! 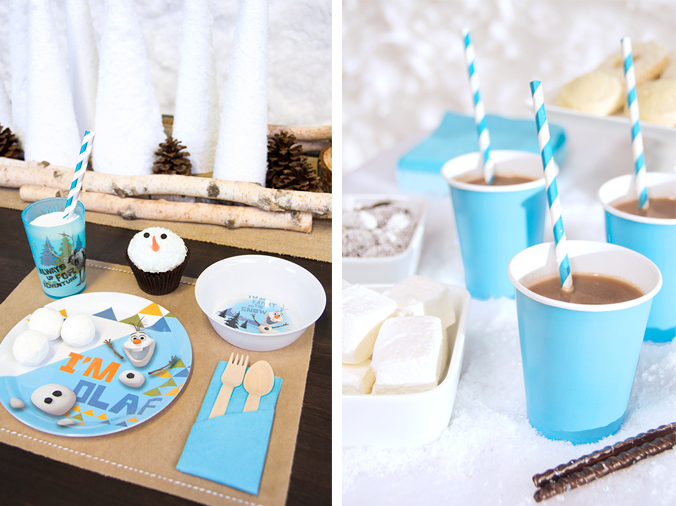 What could make a better refreshment for a winter birthday party than a warm cup of hot cocoa? We just used simple pastel blue cups for ours, but those striped straws definitely add a nice touch. Don’t forget the extra large marshmallows! 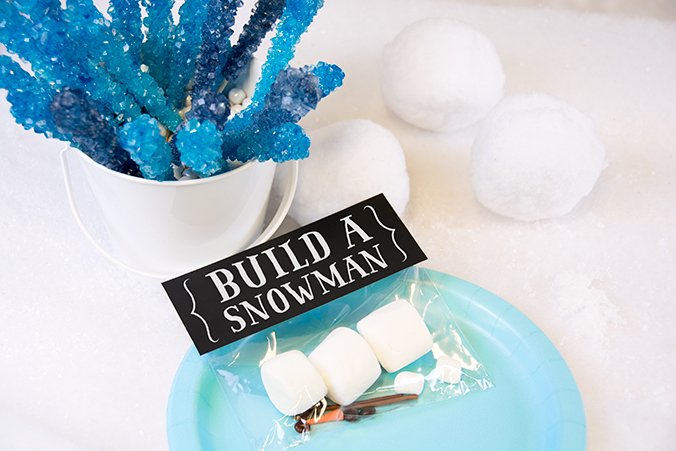 Marshmallows can also be used to build a snowman – if you wanna build a snowman, that is. With printed cardstock and plastic baggies, create kits for every child that include different sized marshmallows and toothpicks to stick them together. Food coloring pens are an easy way to add decorations. It’s a party activity that doubles as a snack! 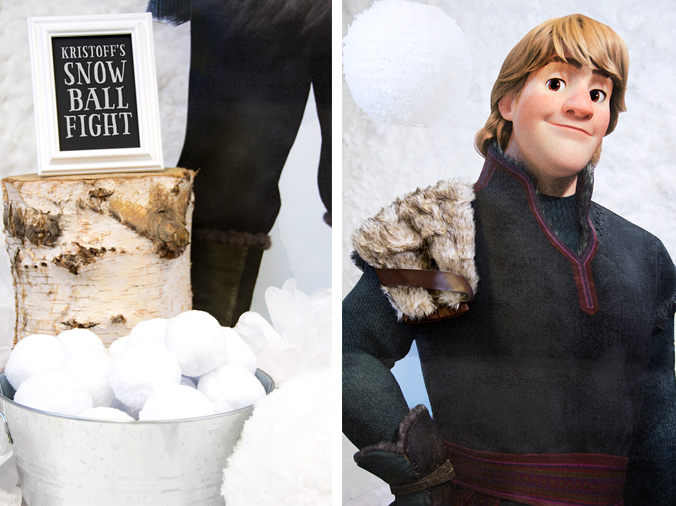 Kristoff’s snowball fight is definitely not edible, but it’s still a ton of fun. Crumpled white tissue paper, new white socks, or fluffy washcloths all make great indoor-safe substitutes for real snowballs. Set up a few targets and knock ‘em down! We were super excited to have Brittany Schwaigert from GreyGrey Designs style this party and take some awesome snapshots for us – check out her full blog post here for the complete details! 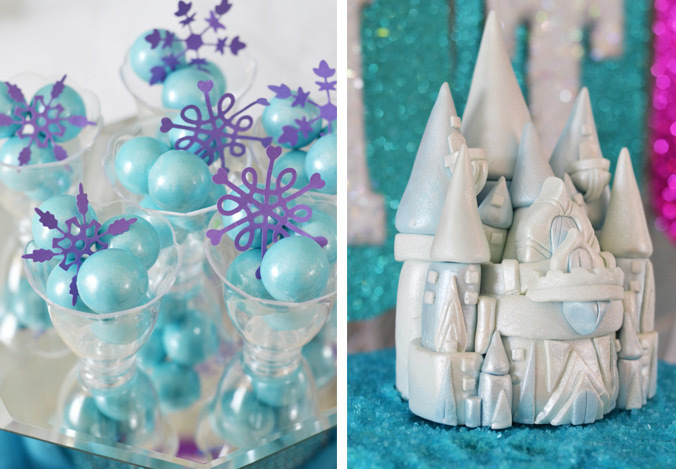 To create your own amazing Frozen party look, keep on reading for the highlights! 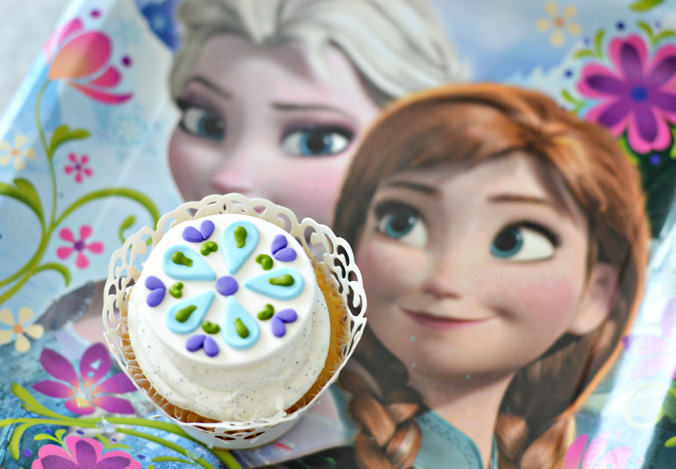 Frozen party plates make serving up snowflake cupcakes even more delectable, and we simply adore how these have been decorated! 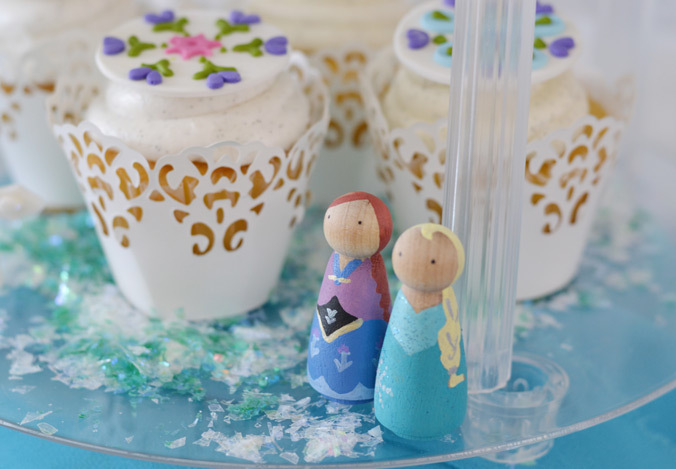 The toppers are from Edible Details and feature floral designs that match Anna and Elsa’s dresses. Who is your child’s favorite? 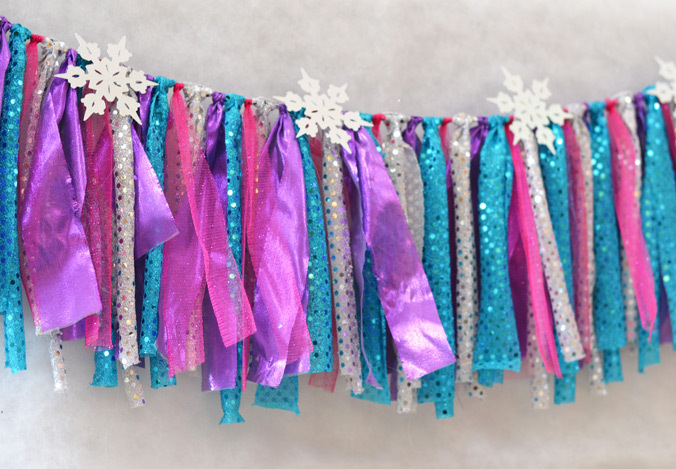 Brittany crafted these handmade paper rosettes to build a gorgeous, glittering backdrop for the party. Loving them! 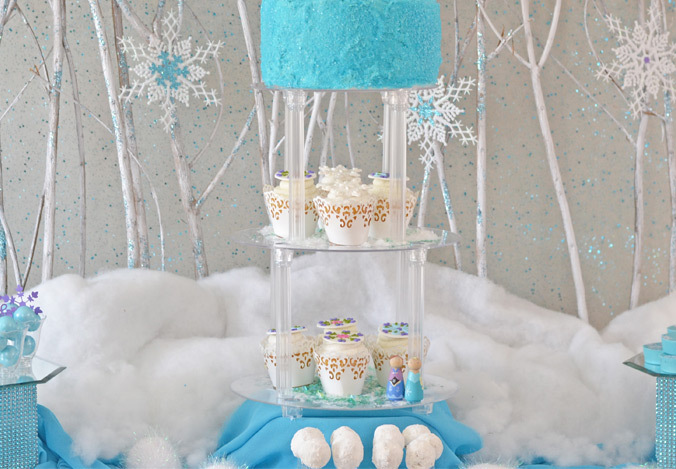 Plus, the Ice Castle birthday cake looks absolutely amazing amidst a sea of snowy white batting and sparkling blue-hued tulle. 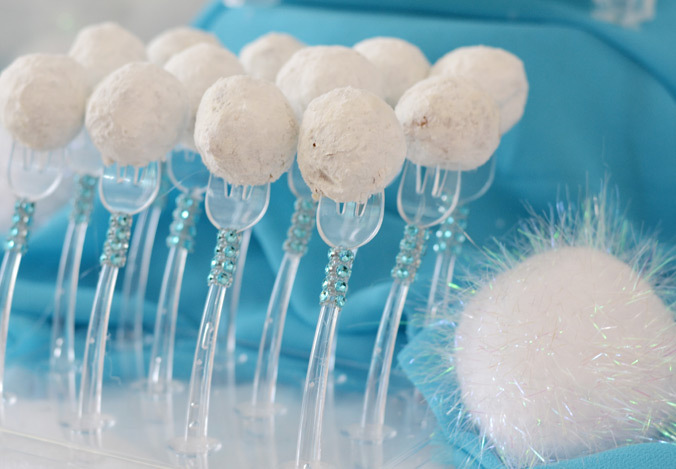 For a snowy Frozen party, snowball snacks are a must, and powdered donut holes on plastic forks make for the cutest finger food you’ve ever seen! Brittany used an acrylic stand from the craft store to show them off, but another option could be to create a floral foam support disguised with batting. The forks are finished with a little rhinestone ribbon! With some clear plastic cake stand pieces available at any cake store, you can build a dessert stand to rival Elsa’s castle itself! Brittany also suggests using lights or LEDs to make it glow. This stunning fabric garland was created by Candace of Lilly Paul Designs. Whether hung along the front of the table or made to be a part of the backdrop, it provides the most amazing burst of color to make the party pop. The girls are sure to love it! 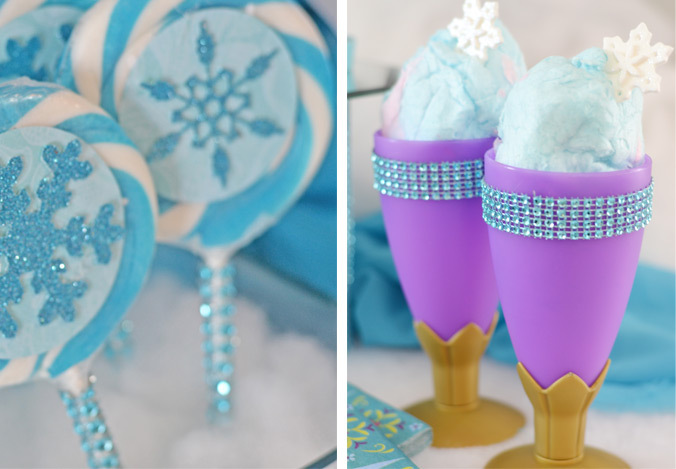 Blue and white Whirly Pops become the perfect treat for a Frozen party when embellished with snowflake cutouts – use a die-cutting machine to make your own, or find some in the scrapbooking section of the craft store! Also, purple goblets make ice cream fit for an Ice Queen. Jenny at Craft That Party made these adorable hand-painted peg dolls. They look just like Anna and Elsa! Use them to complement your décor, or as cute party favors for the guests! Purple snowflake cutouts make our blue shimmer gumballs look absolutely fantastic! The fondant castle is from Edible Details and makes for a magical finishing touch to the party scene! Also featured in this section: Peg Dolls, Craft That Party; Favor Boxes, Piggy Bank Parties; Chocolate Covered Oreos, Sweet Temptations; Wreath, She’s Kinda Crafty; Snowflake Cookies, Kima’s Konfections; Fondant Castle and Cupcake Toppers, Edible Details; Fabric Garland, Lilly Paul Designs; Die Cuts, Sizzix. 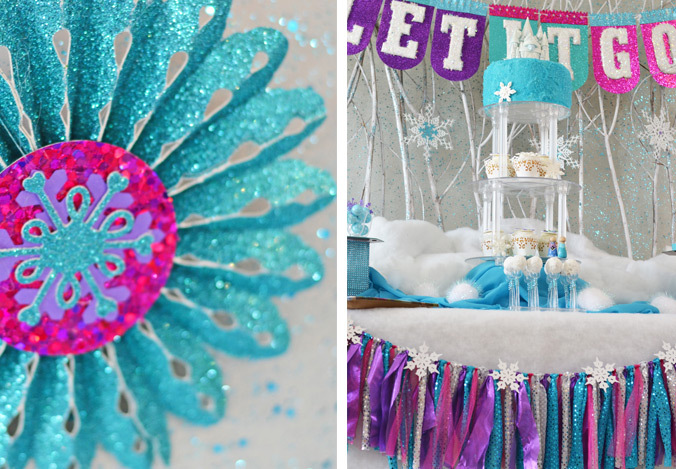 Are you all ready to throw a Frozen party for your child’s next birthday? What kind of birthday party ideas should we come up with next? 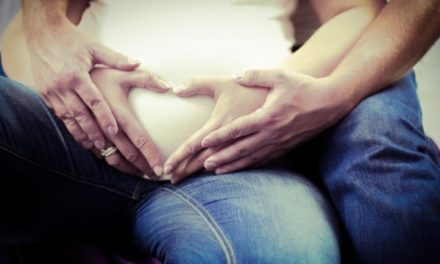 If you liked this post and want to see more like it, let us know! 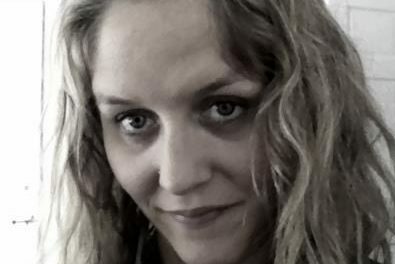 Follow us on Facebook and Twitter @BirthdayExpress or send us a quick email to share your thoughts. 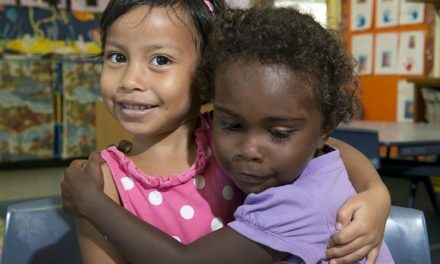 Check us out on Pinterest, too, to discover even more great party ideas for kids! 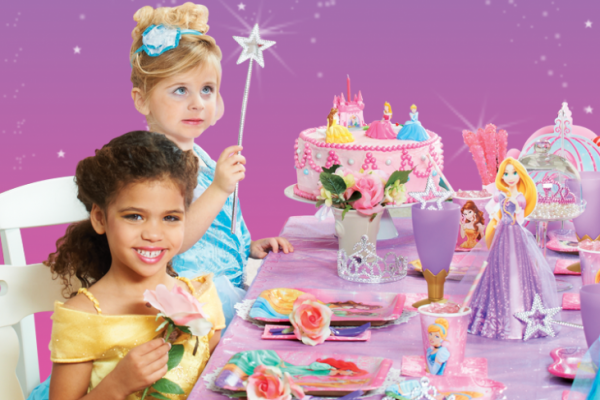 At Birthday Express, we design extraordinary party experiences for the birthday of your child’s dreams. And…we make planning the party a piece of cake! 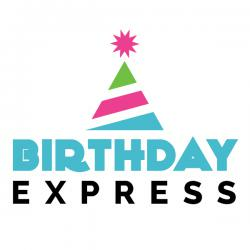 Birthday Express offers hundreds of birthday party themes, plus exclusive themes you can’t find anywhere else! We pride ourselves on helping parents create memorable birthday parties. Where we share our newest products and ideas so you can throw a party to remember.